“On a domestic flight in Sweden, inspired and full of energy from 10 days in Silicon Valley, I ended up next to the CEO of one of Sweden’s largest retail conglomerates, Axel Johnson. The Axel Johnson business dates back to 1873 and includes brands such as Hemköp, Dustin, Kicks and Åhlens. We knew each other socially, but often stayed away from business talk. During the short flight, we began speaking about a common, current interest: the increasing impact of digitalization. However, whilst I felt inspired and excited, he was mostly irritated and concerned. From my perspective, I was enthusiastic about the chances for the small, newly started companies, where I was both an operator and investor. From his side, he was very concerned about their 70 billion SEK business which was at risk of being buried under a digital avalanche. One of his goals for their business was that within 10 years, 50% of their revenue should come from businesses they were currently not active in. Key to achieving this means getting a much better understanding about what impact digital technoly will have on our business, he said. Parting at the end of the flight, we agreed that there was a dynamic relationship between entrepreneurs and investors in early-stage, digital companies and the more established, experienced corporations. Before we went separate ways, he asked me if RECAPEX could join their next management meeting, to see if my energy and inspiration would rub off on their top team. Data-driven analysis of future trends – We started by analyzing the corporation’s various markets, based on a map of digital ideas, trends and companies (national and international). Assassin-watch – We produced several scenarios for which digital trends as well as companies that would have the capacity to destroy the core assets of Axel Johnson. Actionable initiatives – We produced a range of initiatives, big and small, that would increase the digital DNA of the corporation over the next 3 years. Our idea was also that we, RECAPEX, would be active in launching and driving these initiatives. The most ambitious initiative was to become D-Ax, an acronym for Digital Axel Johnson, which became a Corporate Venture arm for the group. The purpose was to invest capital and time into early stage, disruptive, digital entrepreneurs that could benefit from the financial strength of the group, the structural opportunity (millions of consumers interact with Axel Johnson’s brands every week) as well as the entrepreneurial experience and digital competence from RECAPEX. Axel Johnson got the chance of an inside track to this new world and partnerships between the D-Ax investments and the more established Axel Johnson brands began to happen. D-Ax quickly became a key aspect to Axel Johnson’s digital ambitions. During 2014-2016 RECAPEX was responsible for establishing and managing D-Ax. During this period, we researched nearly 1,000 companies and met in depth with several hundred entrepreneurs. 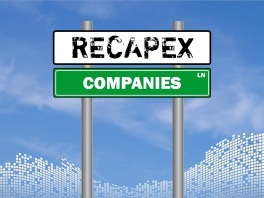 Following detailed analysis of nearly 100 companies, Axel Johnson and RECAPEX co-invested in six of them.